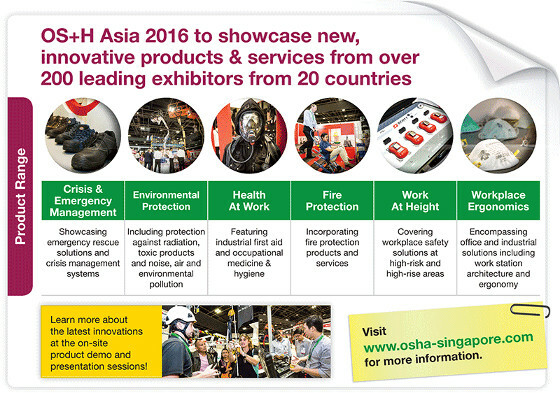 Celebrating its 10th edition, OS+H Asia 2016 - the industry's leading and most dedicated platform for workplace safety + health - is the gateway to discover effective ways to raise OSH standards and achieve a zero-accident workplace. Book your booth today to benefit from our FREE Business Matching programme. This easy-to-use service provides exhibitors with a unique platform to pre-schedule quality networking sessions with fellow international exhibitors and trade visitors. Take advantage of this free service to source for potential buyers and distributors prior to the exhibition so that business negotiations can start immediately. Be inspired by the exclusive showcase of cutting-edge technology, protective gears and a broad spectrum of products including personal safety and protective equipment, occupational medicine and hygiene, fall protection products and industrial rescue systems. For this monumental 10th edition of OS+H Asia, we will also be introducing the new product category, Workplace Ergonomics. Seize the opportunity to be part of the flourishing workplace safety and health industry in Asia today. Only limited booths are available. For enquiries on a comprehensive participation package, contact us at osha@mda.com.sg.